This is plate 22 from Charles Ramus Forrest's 'A Picturesque tour along the rivers Ganges and Jumna, in India'. Forrest was an East India Company official who made several excursions along the great rivers, producing drawings "attentively copied from nature, and in many instances coloured on the spot, ... while the magic effects of the scenes represented were still impressed on [his] mental vision." Forrest was part of a British legation sent to negotiate with Maharaja Ranjeet Singh of Punjab in the early part of the 19th century. On their way, they stopped at Delhi. 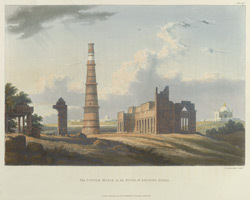 Accompanied by an officer, Forrest visited several monuments and notable local buildings, among them the Qutb Minar. This tower had been erected by Qutb-ud-Din Aybak in 1192 to mark the triumph of Muslim rule in northern India. It rises in five successive tapering storeys covered with magnificent calligraphy and stylised floral designs. The lower storeys are of red sandstone and the two highest are of marble.